Chad Nell was born in Manti, Utah in 1971. While growing up, he noticed that his father, who was a Master Mechanic, enjoyed the challenge of making beautifully crafted arrowheads from flint gathered in the surrounding hills. Throughout his childhood, Chad developed an intense appreciation for seeing things built from scratch while using one's hands and mind to design and create wonderful treasures. Chad Nell has always had a strong attachment to his roots of Utah. Over the years, he has held various occupations but just wasn't satisfied. 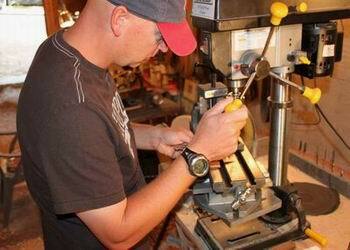 His heart and spirit kept pulling him back to creating and making things with his hands. Being an avid outdoors-man, he always enjoyed hunting. While using a "factory" knife when hunting one day, he decided he should contact his Uncle Steve for some help on building his own custom knife, and that's where he got his start! Thus, Nell Knives was officially born! Here's a great article that was recently published by Specter Tactical about Nell Knives, Chad Nell and how he designs and creates these spectacular custom built knives. Since then, Chad has consistently sold out at every knife show he attends. 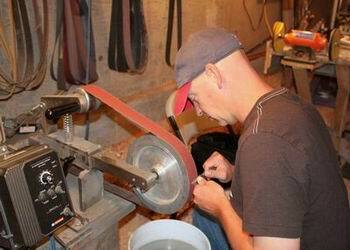 He was honored at the 2011 OKCA Knife Show in Oregon with the "Best New Maker Award"! He feels it is just something within him that helps him achieve that exact precision and beauty while creating a Chad Nell Knife. 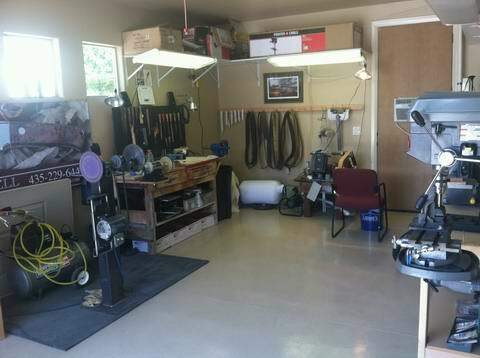 Chad Nell's new shop in St George, Utah where he creates hand made custom knives. Take a look at our Custom Knife Making page to see the various steps that are necessary to create that perfect custom knife!